In the 1970s, Hals et al. did a comprehensive investigation of the secondary caries lesions around various restorative materials both in vitro and in vivo, and natural secondary caries on the extracted restored human teeth [Hals, 1975a, 1975b; Hals et al., 1974; Hals and Nernaes, 1971; Hals and Norderval, 1973; Hals and Simonsen1972]. According to their studies, whatever the restorative material type is, the secondary carious lesion displayed histologically the same basic pattern (Fig. 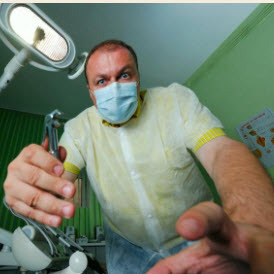 1): 1) an outer lesion, which is caused by the a new primary attack on the outer surface of the tooth; 2) a wall lesion, might be the consequence of the diffusion of bacteria, fluids or hydrogen ions between the restorations and the cavity wall. It is also supposed in their study that the fluoride released from the silicate material would be taken by both the cavity wall and the tooth surface around the restoration, which might reduce glycolysis and induce the remineralization [Hals, 1975a]. Thus, the individual caries patterns between the teeth with silicate materials and amalgam are different more or less. However, this described pattern of secondary caries including the outer lesion and wall lesion has been confirmed in later experiments [Diercke et al., 2009; Thomas et al., 2007; Totiam et al., 2007]. 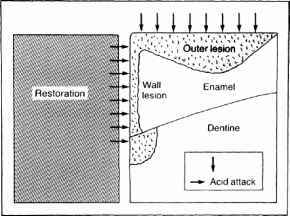 The secondary caries lesion may occur in two parts: an outer lesion, formed on the surface of the tooth as a result of primary attack and a wall lesion formed as a result of diffusion of bacteria, fluids or hydrogen ions between the restorations and the cavity wall (From Kidd, 1990).